Nursery, Kindergarten, Full-Day Childcare – Enjoy all these services and more under one roof at Safari House Preschool. 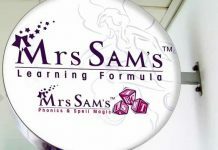 Fun and incredibly effective, Zoophonics, created by two award-wining teachers in US in 1983, is synonymous here in Singapore for its creative and high energy enrichment programmes. 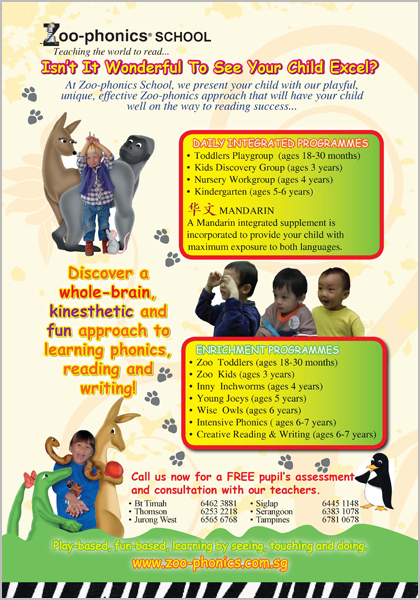 Having enjoyed a landmark success in helping promote English among kids, Zoophonics is finally proud to announce, with the opening of Safari House Preschool, the much anticipated entry into nursery, kindergarten and child-care services. Safari House believes that your child’s early years of formative learning is crucial and provides the foundation for life-long learning. This begins by encouraging self discovery, love of learning, care for others, and an appreciation for the environment we live in. Many parents like Cecilia feel likewise since enrichment activities here are mostly play-based, multi-sensorial and more importantly hands-on. These include language, arts, music, phonics, mathematics, science, nature, physical education, nutrition, grooming and self-care. To complement these, there are also school readiness training plus MOE curriculum based lessons in English and Chinese to help kids prepare for a life in primary school. At Safari House, what you stand to finally discover is the foundation for your child’s ultimate success.